Halfmile has benevolently bestowed, on the hiking community, waypoints for every 1/2 mile of the Pacific Crest Trail (PCT)—over 6000 waypoints! So how are you going to fit all those waypoints on your GPS that only allows 1000 waypoints? Well, if you have a Garmin GPS that is recognized by the Garmin Point of interest(POI) loader, Halfmile has figured out a way you can do it. So get a Garmin GPS that works with the POI loader. I used a Garmin 60CSx that I bought at REI on sale for 199.00. It weighs 6.45 ounces with lithium batteries. It’s pretty much the same GPS as my older 60C but my 60C won’t work with the POI loader. Install the ” Mapsource Trip & Waypoint Managaer” software, that came with your GPS, onto your computer. Unzip the files and put just the .gpx files in a single folder. So, you end up with a single folder with three .gpx waypoint files…one each for CA, OR, & WA. Now download the Garmin POI loader and plug your GPS into your computer via a USB cable. Run the POI loader software, it will prompt you to select the folder where you placed the waypoint files and then it will load all the points in about 10 seconds. You will probably need to set the map zoom level that points display on your GPS. Go to the map screen(on your GPS), select Menu > Map Setup – Points >and then set the Max Zoom for Map Points and User Waypoints to a value such as .5 miles. When set to .5 miles, waypoints and POI’s will display on the map screen when the map is zoomed in closer than .5 miles but will not display if zoomed out farther than .5 miles, so set the number to what works best for you. I set mine for 30 miles. So there you go… over 6000 waypoints saved as Points of Interest on your GPS. I’ve heard of people saving 10,000 waypoints this way. Next you may also like to include all the topo maps for the PCT on your GPS. So pop in your topo software. 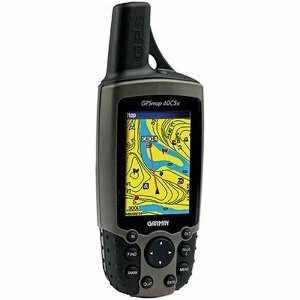 I used Garmin USA topo but Halfmile recommends the Garmin West topo CD. The topo software doesn’t come with the GPS it’s something you buy extra. Next I hit the “find” menu “find places” and started typing in the towns for the PCT and marking them as waypoints. Once you have all the towns marked, highlight all waypoints, right click and select “select maps around waypoints.” Now you should have all or most of the maps you need selected. Look at the map and select any more maps you think you might need. Now transfer maps and waypoints to your GPS. You don’t need a big memory card…I haven’t even put anything on the little one it came with. Note: Garmins Topo software is nothing to write home about. It’s often wrong. For instance once I was standing on Pieper Pass and it said I was 278 ft from it. On the CDT it said I was on the trail and I was on the side of a cliff. Halfmile also freely offers all the printed topo maps for the entire PCT– available for download. Protecting your GPS screen from getting scratched.